Ethereum based VOISE music sharing platform announces token listing on Livecoin and CoinMarketCap, updates whitepaper and roadmap following a successful ICO. July 17, 2017, Barcelona, Spain – Revolutionary decentralized music platform, VOISE has announced the successful conclusion of its recent crowdsale. Following the ICO, the platform has released an updated whitepaper and development roadmap to offer stakeholders detailed information about what they can expect in the coming days. The VSM tokens have recently been listed on Livecoin and Cryptopia exchange platforms, allowing users to trade the token against other cryptocurrencies. In addition, the inclusion of VSM on CoinMarketCap will make it easier for traders to view the token’s market trends and execute profitable trades. These developments have solidified VSM’s status as an officially recognized alternative cryptocurrency. The listing of VOISE tokens on Cryptopia will be beneficial as the platform is recognized by the popular trading app, “Blockfolio”. All the new listing will play a crucial role in attracting new investors who may have missed out on the ICO. VOISE is very pleased with the ICO results, and the team wishes to express its gratitude to all the crowdsale participants. 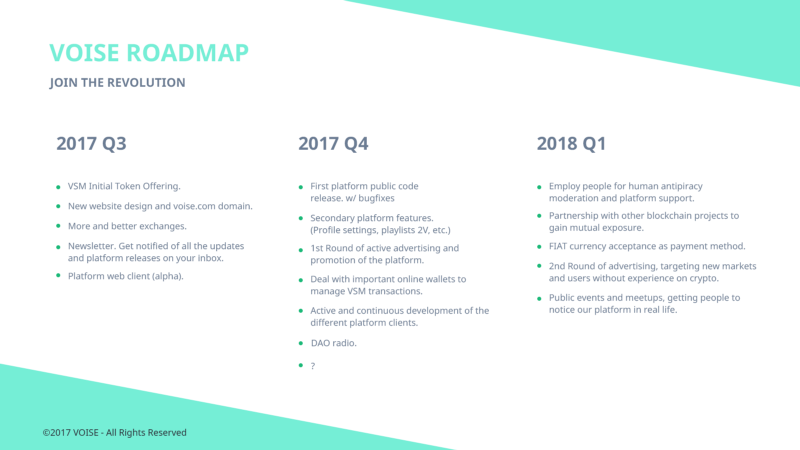 During the ICO, the platform sold a total of 825,578 VSM tokens, distributed across 1151 unique addresses. Of the total tokens sold, 24,787 VSM were offered as bounty rewards and the team has kept a total of 41,279 VSMs. Now that the company has distributed all of the bounties it will reopen the slack channel for serious users who require information regarding company’s development and want direct contact with the development team. All participants and community members are free to join the slack for questions, or advice of any kind. VOISE has also purchased the “voise.com” domain and new servers, and are already working with a team of web and blockchain developers to complete the web client. Development team coordinator and tech consultant of NewsBTC, Jayanand Sagar is currently doing a great job harmonizing team’s developers as the company look to the next stage in their roadmap. The VOISE team has also decided to update the roadmap with more concrete points and dates. In addition, the company has also updated the whitepaper, which now includes some more in-depth technical aspects of the platform and its sections. During this quarter, the platform concluded its crowdsale and purchased the voise.com domain. A team of professionals has redesigned the platform’s website, and it will be published soon. In addition, VOISE has contacted Bittrex and it expects the VSM tokens to be listed during this quarter. Users will be able to subscribe to the company’s newsletters, receiving latest updates about the platform in their inbox. Other developments set for this quarter include the alpha release of the web platform client which will enable users on various devices to access the site without the need for a dedicated native client. The last quarter of 2017 will witness VOISE release the first code commit including all backend code on its public GitHub repository and set as priority fixing in the event of bugs. The company has started working on secondary platform features, to be updated in due time. The first marketing plan will promote the platform and signup both artists and users. VOISE will also be working with leading online wallets to include VSM token support by default while continuing the platform development. During the first quarter of 2018, VOISE plans to hire people for moderation, support and anti-piracy control related activities. The company will also collaborate with other blockchain projects to gain mutual exposure and implement fiat currency payment to ease adoption among mainstream users. The platform will be initiating the second advertising round, targeting users and artists who aren’t used to cryptocurrencies yet. Finally, the company will start organizing public events to showcase the team and the product functionalities to the masses. The white paper has been updated and it now specifies more in-depth technical details of the platform. VOISE will soon publish the new homepage and an updated roadmap with estimated timelines. VOISE is a blockchain-based content distribution and monetization platform for the music industry. It introduces the multibillion-dollar global music industry to cryptocurrencies and blockchain technology. VOISE is the source of this content. This press release is for informational purposes only and should not be viewed as an endorsement by CoinIdol. We take no responsibility and give no guarantees, warranties or representations, implied or otherwise, for the content or accuracy. Readers should do their own research before investing funds in any company.